TULUX is expanding its existing collection with a new LED light strip: JET. Using the latest generation of high-quality LEDs, the new system luminaire resembles a gleaming white vapour trail in the sky. Straight, sophisticated and quick to assemble. All models are customised, fully assembled and leave our premises as products ready for mounting. Excellent assembly options and its seamless integration into ceilings make the JET light strip perfect for lighting architecture and interior furnishings. There are no limits to creativity. 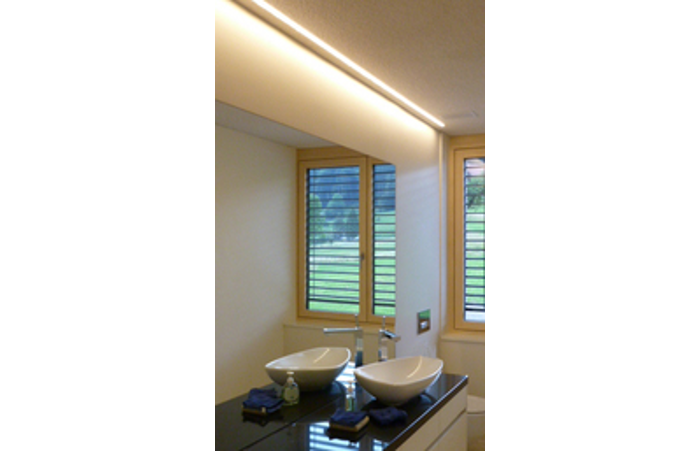 The light strip is available in lengths of up to 5 metres and ensures that light is emitted equally along the strip. The system luminaire is available in warm white and neutral white. An unlimited range of colour moods is provided by the RGB model. The JET LED light strip leaves nothing to be desired. IP20. 24V DC. CRI 85. Anodized aluminium profile. Diffuser in opal matted acrylic glass. IP20. 24V DC. CRI 85. Anodized aluminium profile. Lens in matted acrylic glass. L x B x H = L x 19 x 16 mm. L x B x H = L x 35 x 25 mm.